Today is the birthday of my first literary hero, Jack Schaefer, author of ‘Shane’. 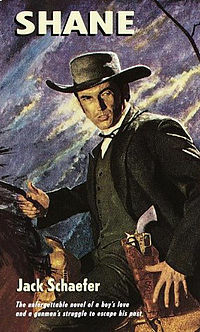 One of my first cinematic memories stems from seeing George Steven’s movie adaptation of the great Jack Schaefer western novel, Shane at the Gaumont cinema in Wolverhampton in 1953 with my father. I vividly recall being startled by the uncharacteristically loud gunshots when Alan Ladd demonstrated his gunfighting prowess to the hero-worshipping, Joey, played by Brandon DeWilde. Only years later did I learn that Stevens had deliberately intended the sounds to be disturbing and had used a recording of a howitzer being fired into a bucket for the sound effect. I loved that movie like no other before or since. Some years later I read the novel for the first of many, many times and, at once, discovered both a literary hero and a model for my upcoming manhood. Thank you, Jack Schaefer and thank you, Shane. This entry was posted in Everything else.... Bookmark the permalink.